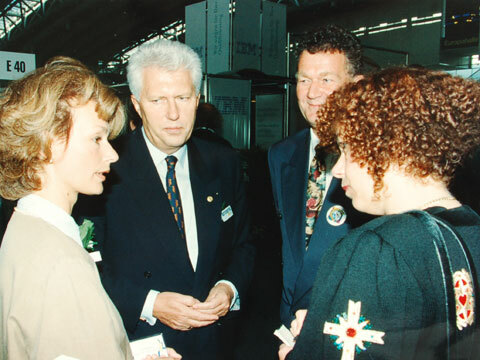 "Integration of Handicapped Person by Qualification"
Hiltrud (Hillu) Schröder, (left) at that time wife of the Minister-President of Lower Saxony, Gerhard Schröder, talking to a journalist at the “Integration through Qualification” event at the “Qualification`94. Hubert H. Lange, member of the baord of Deutsche Messe AG, is listining. The project management at the “Qualification`94” was done by Arno A. Evers (2nd right) and his team from Unterföhring, Germany. 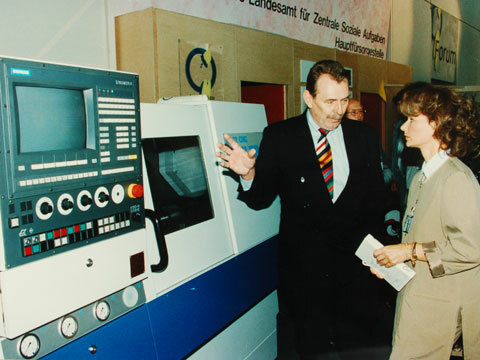 Hiltrud (Hillu) Schröder, at that time wife of the Minister-President of Lower Saxony, Gerhard Schröder, together wit a representative from the “Hauptfürsorgestelle” at Hannover, is getting first hand information about a CNC driven milling machine.